Hollister Premier Series Drainable Pouch is an ostomy pouch designed with comfort in mind, as it is anatomically shaped. 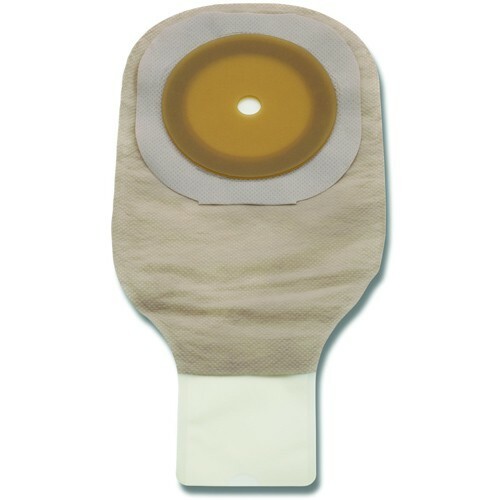 With pre-cut openings and an extended wear skin barrier, Flextend, this ostomy pouch has a tape border and equipped with an odor barrier and rustle-free design to provide a completely discreet user experience. Hollister Premier Series Drainable Pouch has a clamp closure and is transparent in color, allowing users and caretakers to quickly check the stoma output. Woven with ComfortWear Panel on the body side, this ostomy pouch with extended skin barrier is the ideal pouch for anybody seeking a discreetly comfortable, user-friendly experience. You may also be interested in similar drainable ostomy pouch products and supplies, such as Hollister Karaya 5 Drainable Pouch, 16 inch. Easy to close; simply roll it three times in the same direction, press from the middle out and feel the seal. Easy to use and to empty - simply lightly pinch the sides of the leak-proof outlet for easy control of content flow. Can be easily cleaned by simply wiping down the inside of the pouch tail with a damp tissue. Product numbers: 8631, 8632, 8633, 8634, 8635, 8637, 8638, and 8639.